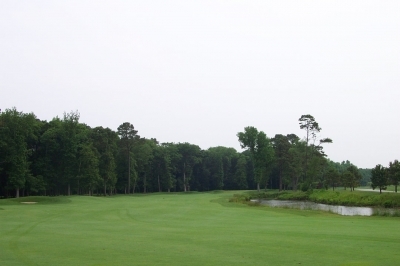 BERLIN, MD -- "When you're building everything from your heart and shooting from the hip, and you don't have a regulated set of drawings, you never build the same golf hole twice," said PB Dye, when asked why his courses seem to offer many different looks, almost simultaneously. If there's one defining characteristic of PB Dye's work, it's that it can't be defined. He'll build in some par fours that probably can't be reached in two by a good portion of the public. He'll build some par fives that can be reached in two by average hitters; and he'll throw in some par threes that defy logic. An old wooden boat lies beached on the shore of Rum Pointe's 16th hole, along with quite a few golfers' rounds after playing this hole. 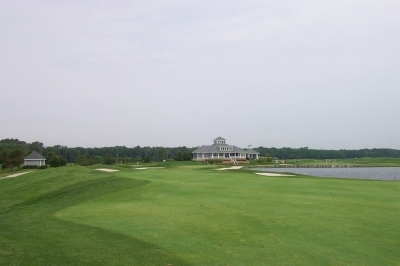 If you're looking for that type of 'variety is the spice of life' philosophy, try Rum Pointe Seaside Golf Links in Berlin, Maryland, just a few miles south and west of Ocean City on the eastern shore. Rum Pointe's got so much diversity, so many different looks and adds some odd twists and turns -- it almost seems like you're dizzy from swilling the drink that's part of the facility's name. PB, like his father Pete Dye (who also shares recognition for the design), is known for creating some challenging golf courses. That's certainly true of some aspects of Rum Pointe, yet for this oceanfront layout he's also built in a fair amount of playability. The course adds up to one yard over 7,000 from the tips, yet can play longer or shorter depending on the severity of the wind. The driving avenues are generous, the borders are wide on all but a few holes, and the slope rating for the course is a tepid 122 from the back tees. This is not your standard PB Dye creation. And according to Ruark Golf's Head Golf Professional, Dennis Winters (Ruark Golf owns Rum Pointe and The Links At Lighthouse Sound), it's also a local favorite: "Rum Pointe is probably the most popular course in the ocean resort area, and people always come back to it because it's very player friendly. You can make it as tough as you want it, but you can also make it as easy as you want it, too." Which makes Rum Pointe a different animal than its sister course at Lighthouse Sound, which was intended to play much more difficult, and it does. 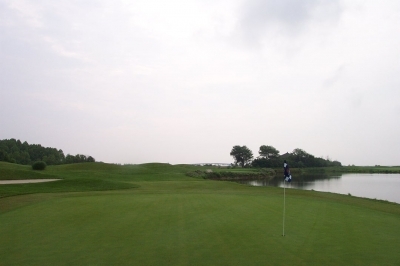 Hook one a bit too much off the tee of the par five 8th hole, and your ball has located the bay. Both Winters and Dye credit owner Tom Ruark for the success that today is Rum Pointe, saying it was his flexibility and willingness to work with the governing authorities that carried the day. 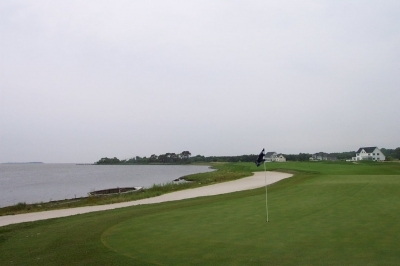 Dye elaborates: "When we first started out at Rum Pointe, it was going to be 27 or 36 holes. Then the state park folks wanted the property just to the north, which contained an old historic mansion (the Colonel Charles Radcliffe house, as is explained nicely in the yardage book), which was some sort of landmark." Dye continues, "I think I did more layouts for Rum Pointe than any other golf course I've ever designed, because the parameters changed from month to month -- due to Tom's negotiations with the Parks Department. Ruark ended up making a deal with the park people to let them acquire that portion of the property, then he scaled back the number of houses he'd build at Rum Pointe, and limited it to 18 holes. So, there's only one golf course there and fewer homes, but let's just say he got a really sweet deal on a pretty darn nice piece of oceanfront property because of it." That goes without saying. Though you'll have to wait a few holes before you get a good look at the ocean, when you do reach it, it's an incredible view. Just off the tee of the eighth hole lies the Sinepuxent Bay, and in the distance is Assateague Island, known for its preservation of wildlife and things natural (Rum Pointe itself is an Audubon International facility). Several more holes afford views of the water, offering a very tranquil addition to the fine golf course found there. The short par five 10th hole is probably reachable for a good percentage of golfers - if you hit it fairly long and very accurately. And, as Dye mentioned, there's history to the spot -- and the mansion just off the sixth hole is known for more than just being old. 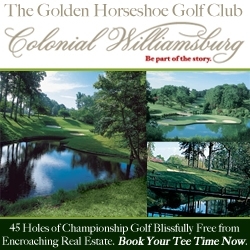 Winters tells the ghostly tale: "The old house that's just off the sixth hole was apparently built during the Colonial period. Legend has it that the family that lived there -- its sons refused to fight for the English during the Revolution, and the Redcoats ended up hanging one of them." Many people have lived in the house since, and they've told of some paranormal happenings. "The last person to live in that house was an upstanding citizen, and a friend of Mr. Ruark's. He said he had to get out of there, because of the weird stuff that's going on in that house. It's a similar story to others who've spent time there. I myself visited it just the other day, and it's spooky." Supernatural inhabitants or not, the state historic preservation folks are planning to preserve the mansion for future posterity. It'll continue to add an interesting side-note to the golf course right next door. There's more than just ghosts involved in the Rum Pointe saga. Again, Dye elaborates: "Right when we were working on Rum Pointe, I found out I had cancer. Well, I had surgery, which basically put me out-of-commission for about three months -- so I asked my Dad (again, Pete, who was working on Bulle Rock in Havre De Grace, Maryland, at the time) to make a couple visits to check on how things were going there. So, he made the stops and everything went on smoothly -- and I told Tom Ruark that he could use both of our names as designers if he wanted to, since Dad had done some work there." The grassy roll-off areas around the 13th green may remind you of Pinehurst. The short-game challenge certainly will. Cancer surgery may have taken Dye away from the project, but working on it also provided some healing therapy: "Just like my Dad, I don't use any drawings to build the green complexes -- it's a lot of hands-on work, which is something I really enjoy. Some of those holes, I can tell you -- 10, 11, 13, 15's one of 'em... I'd basically just gotten over cancer surgery and wasn't supposed to be doing anything, but I wound up inside a bulldozer anyway," chuckled Dye. It's said that Americans have a love affair with their cars, but Dye's object of amore is a bit different than your run-of-the-mill four-wheeler. "They had one of those brand new Komatsu D65's with double insulated glass cabins. It had two joysticks, and it was just like flying one of those Star Wars rockets, you know? Oh man, I'll tell you, with a good set of headphones, air conditioned, heated, anything you wanted. Dust free? Are you kidding me? I got in that thing and said, 'Oh baby, it's uptown!'" Happy to report, cancer was defeated. Perhaps the first time a bulldozer ever aided in curing the disease. It's a bit hard to tell from this photo, but that's a pretty sizeable bump in front of the putting surface on the 15th hole -- and the green's pretty curvy, too. The result of Dye's therapy was an impressive lot of green complexes, all with different looks. Thirteen and fifteen in particular stand out. Having visited Pinehurst about a month previous to taking on Rum Pointe, thirteen's green looks straight out of North Carolina -- with a crowned green and roll-offs to the sides, where you can either chip it, putt it, or flop it if you dare. Fifteen's got a huge mound in front of the green, providing what amounts to a blind approach, even though the hole's perfectly flat. Then, once you're on the putting surface, what a roller-coaster ride awaits -- probably the most undulating green on the course. Having seen the course, it seems to play more difficult than its rating (72.6) and slope (122) would indicate, primarily because of some par fours that certainly would make professionals smile to walk away with par. Dye says he doesn't get the ratings, but that Rum Pointe compares favorably in difficulty with his other courses. "I don't slope golf courses, so I've got no idea how they got those numbers. But some of those folks might show up on a day when everything's mowed down real nice, like the last time I was there, where you can find the golf ball and everything. There's certainly a lot of room out there, so maybe that's the reason," Dye mused. Here's a Dye trademark -- par three over water, railroad ties bordering the green. In this case, Rum Pointe's 5th hole. But again, those par fours. Hole seven measures 471 yards from the tips, and doglegs right. You'll need a pretty solid poke just to see around the corner, then another to reach the vicinity of the green. Hole sixteen may be Rum Pointe's #2 handicap hole, but takes top honors for toughest hole (#7 is the #1 handicap hole). It probably plays into the wind most days (463 yards), and for you slicers out there, the bay's just calling your name. In addition to the challenge, the beauty mesmerizes you. Some holes are born, others are made. Sixteen fits the latter category. "It took some finagling, but I got that little bit of fill we needed on 16 green. We showed what we'd do with planting grasses and putting the baskets down there and did all that stuff and brought everyone down there -- then everybody was ecstatically happy with all of it," Dye said. PB Dye won't cheat you on the last hole on any of his courses. Rum Pointe's 18th hole is 444 yards in length, and you'll have to shoot straight the whole way. Other holes you'll be ecstatically happy with begin with hole five, a 175 yard par three, with a full water carry. The signature Dye family railroad ties line the green, and though this hole is short, you'll have to be precise with your club selection. A large bunker waits on the right side for anything in that direction, and water will swallow anything left. If you're long, it's a downhill chip to every potential pin position. Don't scull a wedge here. Eight is a very nice par five along the bay. It's more than just pretty scenery, it's a strategic hole as well. Not long at 540 yards, it doglegs left around the water, so cut off as much as you dare if you hope to go at it in two. The second shot requires supreme accuracy, as the green's well guarded by bunkers. Holes ten through twelve are relatively tight, short and tree-lined, contrasting the open nature of the front nine. 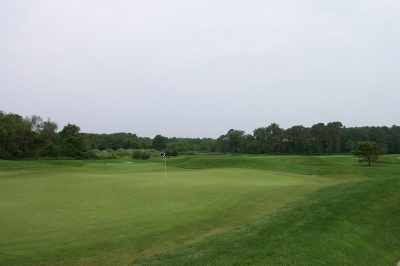 Fourteen is the toughest par three on the course, 223 yards in length and demanding a carry over water and a hefty bunker to a reasonably large green. Wind will certainly dictate play here, and it's not easy to gauge as trees surround the green. In a typical dramatic Dye finish, eighteen and nine mirror each other, doglegging in opposite ways around the same lake. Nine's a dogleg left, eighteen's a dogleg right. At 444 yards, you won't be cheated for a final birdie try on the concluding hole (the two holes are also overlooked by the impressive clubhouse -- a great example of fine planning). 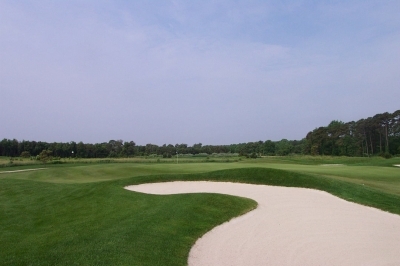 Rum Pointe is a complete golf course, and it's not at all hard to see why it's so popular. Though PB Dye doesn't use a set of drawings, it's clear that whatever's in his head is more than satisfying enough. Think about that the next time you have to ad-lib a situation -- it just might turn out alright, after all. Seeing as this was our first trip to Ocean City, we wanted a place that was family friendly, convenient to the golf courses, apart from the heavy party areas of the city, and affordable to boot. 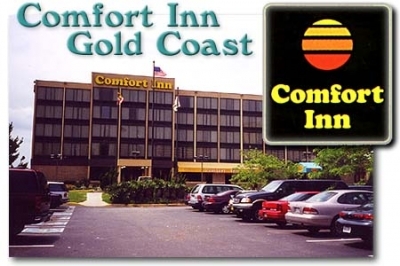 We found what we were looking for at the Comfort Inn Gold Coast, located at 11201 Coastal Highway in Ocean City. The Comfort Inn Gold Coast provides access to the beach without paying beachfront prices -- and offers a very pleasant trip to the shore without a lot of frills, hassles or bills. And even better, it also offers packages to visiting folks hitting the links. Golf Package Hotel Accommodations include: 2 double beds; microwave oven; refrigerator; wet bar; coffee maker; cable TV; indoor heated pool and Jacuzzi; a Denny's 24 hour restaurant; first floor guest laundry facilities; 24 hour lobby convenience store; grocery store, pharmacy & beer, wine & liquor store nearby; and meeting rooms for hospitality and social gatherings. A stay at the Comfort Inn Gold Coast can be combined with all the excellent golf courses in the area, and package prices vary throughout the season, ranging from $105 - $249 for weekday (M-Th) stays, and $139 - $295 for weekend visits. Rates are per person, double occupancy required, based on availability. Single rates are subject to surcharges, and Golf Widow packages are available! These folks also pride themselves on customizing golf packages. For information, or to book a package, call the sales department at (410) 524-3000. To contact Choice Hotels, call toll free 1-800-228-5150. Or, visit them on the web at www.comfortgoldcoast.com. Though we'll hardly be able to provide a complete rundown of local eateries (or even an adequate one, for that matter), we're happy to recommend PizzaTugos. We wanted to try a 'local' pizza joint in Ocean City, and it doesn't get any better than PizzaTugos -- and they're open practically all night, too -- perfect for those early morning beer, poker and cigar parties. Head of Agronomy for Ruark Golf: Paul Latshaw Sr.
During the peak season (spring and fall): Mon-Thur, $95, Fri-Sun, $105. During the summer months (last week of June to the 1st week of September): $89 for weekday and weekend, prior to 1:00 p.m. After 1:00 p.m., it goes to $55. Twilight rate (after 4:00 p.m. is $36). Rates includes range balls and carts (with GPS system). Walking is unrestricted at Rum Pointe. 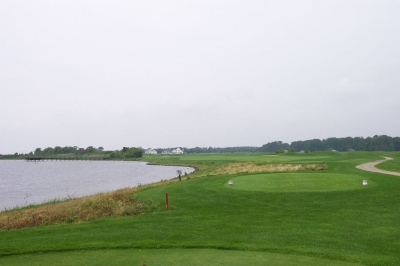 Rum Pointe works with Ocean City Golf Getaway and Pam's Golf Packages (We booked through Ocean City Golf Getaway and found it very satisfactory. The telephone number is 1-800-4OC-GOLF).